It was revealed ahead of his Spring 2017 show last September that Simon Porte Jacquemus’ eponymous label was expected to generate €5 million euros in revenue. The Business of Fashion article exposed the answer to the question on many fashion industry members’ minds: is his surrealist fantasy commercially viable or is it awaiting closure. The answer, however, should come as no surprise given his maturation as a fashion designer in the few short years he’s been in business. What started out as a devilishly naive effort. In recent seasons it has blossomed into a demurely divine operation that has distanced itself from its early, angsty childlike preoccupations. Fall 2017 was influenced by a number of things: an impossible love story, the forties and fifties, Christian Lacroix. The impossible love story pertains to the title of the show ‘L’amour d’un gitan’, which translates to ‘The Love of a Gypsy’. The story goes that a Parisienne with a luxurious lifestyle and an affinity for all things couture is besotted by a gypsy man and they flee to the South of France—where Jacquemus hails from; however, it is too much to ask the woman to separate herself from the lavish enclaves in which she had been settled for years: in short, you can take the woman out of Paris, but you can’t take Paris out of the woman. The convergence between good and bad taste was marked in this collection. The Parisienne woman’s journey to the Riviera. Clothing became looser, tailoring was more supple. There were gold embellishments that veered distinctly toward bad taste, sharply tailored trousers with a firm foot in the foundations of Parisian turf. It was all filtered through glamorous clothing that emerged during post-war austerity. The rich were still present and they were elaborately decorated, in long overcoats with exaggerated hips, proportion-defying suiting, and geometrically challenging pieces. The sober colour palette and severe tailoring pointed to this, only to be complemented by the Lacroix references. 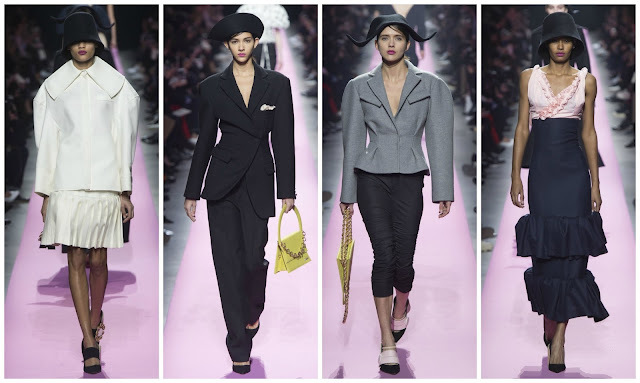 Christian Lacroix came into play as he was the first fashion designer Jacquemus was introduced to, after attaining the age of seventeen, in Arles. Lacroix is a world-renowned designer. His critically-lauded career and namesake couture line was characterised by brilliant indifference to wearable fashion, favouring spectacular costume-inspired garments that served as a fashion statement but also underscored notions of fashion as theatre. His work is resonant in Jacquemus’: less so is it audaciously, wildly colourful but it is similarly dramatic. The models walked unassumingly slow down the catwalk, a painstaking pace that sharply contrasted with the ensuing show at Saint Laurent. There cloche and curvilinear headpieces adorning the models’ crowns that instilled a strong sense of self-worth, self-importance—it related back to ideas of wealth in a post-war society. It eschewed from being overly anachronistic—the surrealist elements linked back to the present, with sharp, inventive cuts and silhouettes. Jacquemus, as evidenced by the impressive sales figures it boasts, has bloomed.